We have a cracking weekend of rugby coming up and the star of the show is GB Wheelchair Rugby (GBWR). 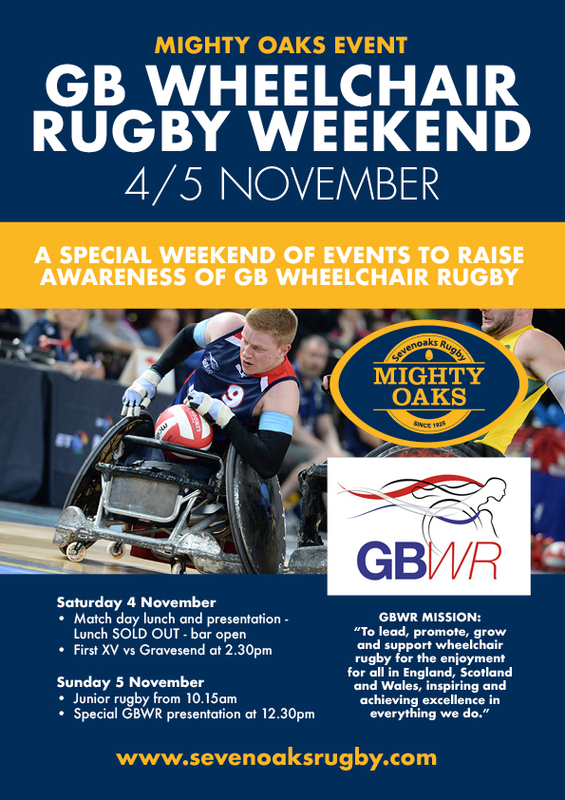 We expect a huge crowd at Knole Paddock, Plymouth Drive for the fun and activities outlined below., so please spread the word with extended family and friends to join GBWR and the Mighty Oaks for a weekend of inspiration and excitement. On Saturday the Sevenoaks Rugby 1st XV hosts Gravesend I and the 4th XV hosts Maidstone III. Although our pre-match sit down lunch is sold out, the bar will be open and the GB Wheelchair Captain and Chairman are the guests of honour. Following Saturday's away win at Cobham the 1st XV are looking in fine form and the 4th XV are top of their league. Both matches kick off at 2:30pm. There will also be the chance to 'buy a pint' for GBWR at the bar: If every Rugby Club member up and down the country gives just £5 to the cause- by way of offering to donate one of the GB players the price of a pint, it will help replace the charity's funding that was pulled by UK Sport, and give players who have fought to the pinnacle of their sport the chances they thoroughly deserve, including representing GB at the next Paralympics. On Sunday the juniors are centre stage and all players will have the chance to watch a demo of Wheelchair Rugby by the GB team. A handful of young Oaks will also have the chance to give the exciting sport a try, filmed by a professional crew to generate footage that will feature in national media for GBWR up and down the country. There will be commemorative programmes throughout the weekend, for a discretionary donation to GBWR, and to round off proceedings a short presentation on Sunday at 12.30pm on the balcony. All this plus a healthy Juniors fixture schedule to enjoy on the Sunday, including the Under 14s hosting the Kent Prelims, the Under 15s hosting Blackheath, and the Under 18s hosting Old Alleynians.